Tomorrow night my trip is over and I still have lots of things to draw. 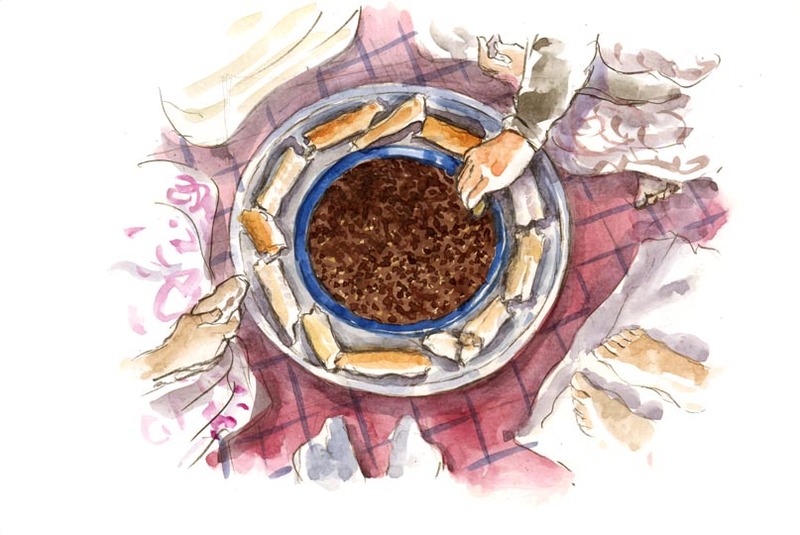 I came with the idea that in this inhospitable land where Sahrawis had never before pitched their haimas, there was plenty to enjoy. Because there is something everywhere and here it is always related to people and families. The way people treat objects is what gives it that aesthetic meaning to everything that surrounds them. Coal embers are essential for tea, because they keep the water at an ideal temperature for the long duration of the making of the tea. But I did not imagine that in the homes they prepare it with butane gas, on a kind of flat pan full of holes, like our cooking pans for baked chestnuts. Something else I see that seduces me is how they present the everyday dish of food, surrounded by pieces of bread and the bread, along with the direct use of the right hand, are their cutlery for eating. So everyone has the necessary for their part of the dish. I love the way in which they serve it and Ahmet, with his elegant darráa in the midst of the goats. 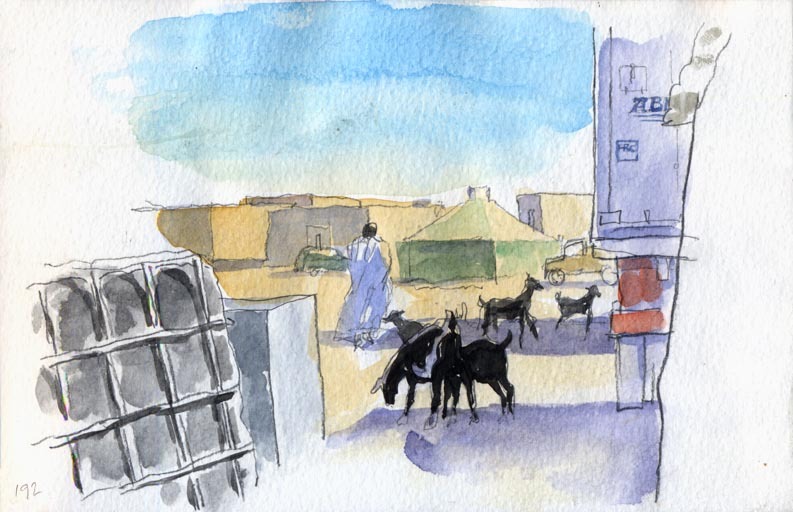 Someone told me that in Mauritania they never take the darráa off even the car mechanics. And I assure you it is not an easy garment to wear. I had already drawn the free and easy way of life in the gaitun, but now I want to draw it with my host family. Aziza, Shabu and their uncle rest leisurely after breakfast. Today I finish off my sketches with something else that has always struck my attention, a type of goat pen and today I finally understand what it is, but without them and being near the haima, I can see - No, it's not a pen it is a store, right there, open in the middle of the street. I realize now that they are placing and removing belongings and tools. Ahmed told me once that nobody takes what is not theirs. It may not always be one hundred percent true, but it is customary.